Remote control systems have valves matched in size to the blast machine piping and the remote control systems styles vary to suit the blasting operation or application. Pneumatic remote controls work best in blasting operations with blast hose lengths less than 100 ft. Electric remotes—powered electro-pneumatically—are best suited for hoses greater than 100 ft.
Twinline Remote systems are pressure-release pneumatic systems that operate on a return-air principle. TLR 50 controls are for machines with ½” piping, TLR 100 controls are for machines with 1” piping, and TLR 300 controls have 1-1/4” piping. While pneumatic TLR systems require twinline hoses to carry air, Electronic Remote Systems operate with an electronic cord, which prevents signal delay over greater distances. 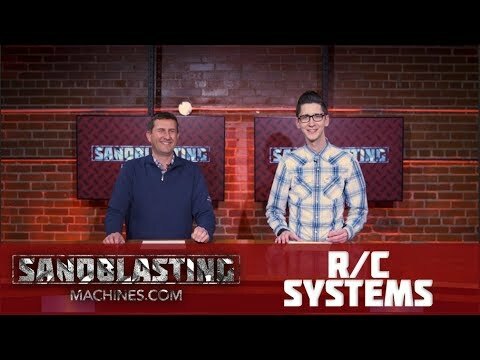 TLR systems include all components of a remote control system for a classic blast machine setup, including inlet valve, diaphragm outlet valve, RLX control handle, and twinline hose. Clemco’s contractor-style sandblasting machines differ from classic blast machines in that they have a 2-in-1 Millennium Inlet/Outlet Valve assembly to be used with a RLX control handle and twinline hose. We also carry contractor pots bundled with remote controls to take the guesswork out of choosing an appropriate remote control system, as well as classic blast pot packages with remote controls. If you have any questions regarding our products, or can’t find what you’re looking for, please feel free to contact us at our toll free number: 1-855-358-2858.